Welcome to September / October edition of the Inheritance Recipes! Thank you for all your August entries that can be seen in the round-up on Solange’s blog. Summer is sadly over but you can always recreate some of the memories by making foods from places you have visited. We have been camping in Little Torrington this summer, visited Woolacombe among other beautiful places (travel post will follow shortly) and as a result we made some delicious roasted vegetable Devon pasties on our return. And what have you been up to this summer? We would love to hear about your adventures. As you probably now we took AncestryDNA test some time ago. As a result we have started working more intensely on our family tree and even managed to reach 1600s on some of the branches. Our EuroCaribbean Family Tree website will be finish shortly and will have proper tree at some point, for now we are still researching and trying to connect missing links but the draft of the tree can be found here if you are curious… There is lots of German and also some Czech surnames on my side of the family, something I was not aware when I was starting my AncestryDNA journey. We will share your recipes via our social media channels and include in the round-up (with pictures) at the end of the month. 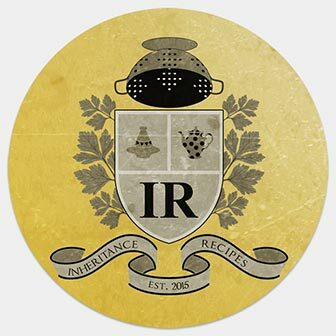 We will also add your recipes to the Inheritance Recipes Pinterest board (that has 3.7 K followers), Inheritance Recipes Facebook group and include your blog’s handle in our Inheritance Recipes list on Twitter that we re-tweet often. Don’t forget to subscribe to them all! Closing date for this linky is the 31th of October 5 pm GMT. Please note that entries that fail to follow “how to enter” instructions won’t be approved, allow 48 hours for the entries to appear in the linky below. Full round-up with pictures will be posted at the end of October. I’ve been thinking about the challenge recently. I have so many recipes, it’s just a matter of whether I manage to make and post them!